a new type of tactile strip to warn them when they are walking too close to the edge of the platform. They will also see the foundation for equipment for TriMet’s future electronic fare system. Access to both the eastbound and westbound MAX platforms via stairs and elevators will return to normal at the west end of the station. However, the east stairs will remain closed for the last phase of the improvement project. The multi-phased project began on July 2. To minimize impacts on our riders, phase one work was done on the back half of the east and westbound platforms. 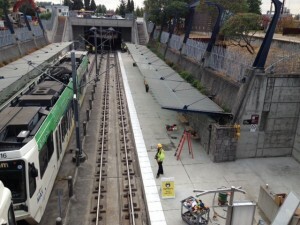 Crews worked in the overnight hours to saw cut and remove portions of the existing platforms. During phase two – the phase that required the closure of the platforms – TriMet and the general contractor, Brown Contracting, Inc., removed the remaining sections of the platforms, and poured new foundations and cast-in-place platforms and tactile edges. The station opened in 1998 and needed essential updates including replacing the platforms. Water drainage issues washed away grout that secured the platform tiles to the platform, leading to cracks and loose tiles. The new platform is made using materials that will be more durable. Crews also made adjustments to the grade. The total project cost is $1.7 million. Crews will be cutting architectural score joints, installing payphones and wrapping up other punch list items. All MAX and bus service will be maintained during this last phase.